Field Supervisor of Trench PF 11, Ashley Bennett. After several weeks of hard work put into PF 11 in the FOD, I am sad to say that this is the last report you will read for this trench. 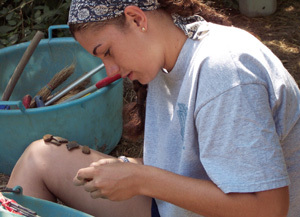 In the beginning, one of the hardest things to live with as a student of archaeology is the fact that, "It is not what you find, but what you find out." This quote certainly applies to the excavation of PF 11, as we have so quickly excavated down to Stratum 3 and bedrock over the entirety of the trench. Let us backtrack a bit though, and look at what has developed in PF 11 since last week. As of last Thursday, we had already excavated a portion of a kiln in Locus 2, which helps to complete the kiln found in PF 6 2001 extending in this direction, and additionally we had found two areas in the southern portion of Locus 3 where we did have Stratum 2. It was highly included and had visible artifacts within it. This was promising, as Stratum 2 represents our archaeological level and possibly interior space of the building in the FOD. It was disconcerting, though, that we were not finding it below Stratum 1 in other areas of the trench, but rather we were excavating out Stratum 1 only to find the sterile soil and bedrock beneath. While this may sound like a disappointment, we actually found several very prominent and important features within this lower stratum. The plow mark we called Feature 2 last week was actually only the first sign of what would prove to be large and highly intrusive plow marks that run the length of our trench in a northerly direction. There are five of these plow marks, and they make an already known fact very obvious. The deep tines of the plow have raked this entire area, and even our archaeological levels have been disturbed by this action. This fact must remain in our forethought as further excavation of the Podere Funghi is carried out. 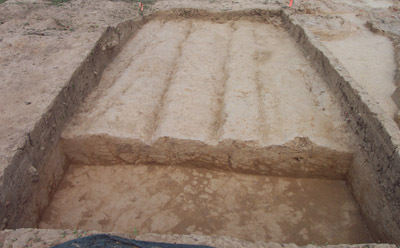 Plow marks in bedrock mark the completion of excavation in Trench PF 11 at the end of Week 3. So, while PF 11 is coming to a close as we take final elevations and drawings, we are already in the midst of opening yet another trench, which we will excavate for the remainder of this season. Located on the top of Poggio Colla on the south side of the monumental building, will be PC 24. The students spent the majority of today clearing this area and preparing it for excavation, which will commence tomorrow. 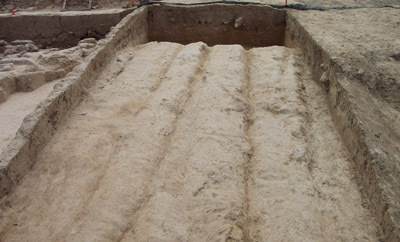 View of Trench PF 11 from the south at the end of the 2002 season. 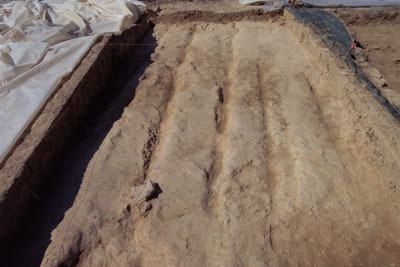 View of Trench PF 11 from the north at the end of the 2002 season.